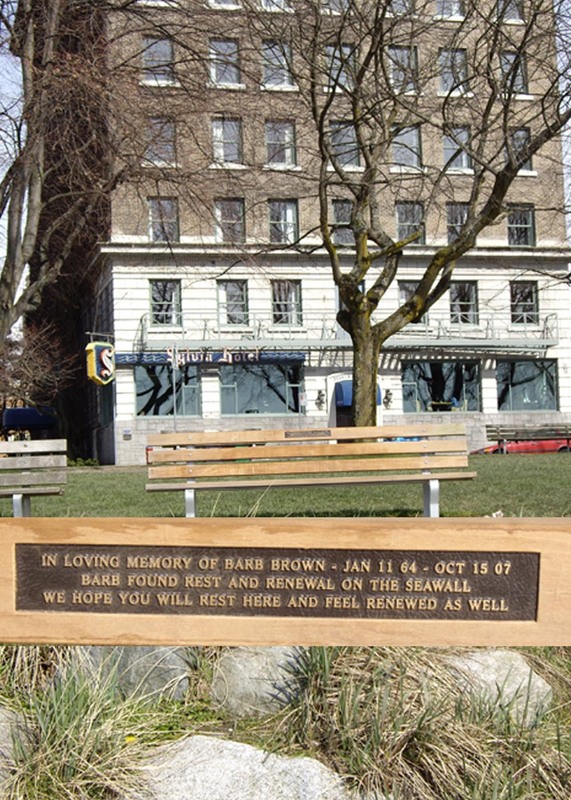 Barbara Janet Brown (Barb) January 11, 1964 – October 15, 2007 Peacefully – but far too soon, at the age of forty-three Barb passed away suddenly at St. Paul’s Hospital, Vancouver, BC, on Monday, October 15th, 2007. Barb was above-all a decent human being; a committed activist and educator, a fine friend, a charming, smart, often irreverent and always complex woman. She leaves behind many family members, friends and colleagues who are shocked and grieved by her sudden death, notably her beloved husband Mike Dumler, parents Lois and Dave, sisters Lynn and Catherine (Larry), brother Gordon, great-uncle Walt, aunts Joan, Marion and Donalda, and many cousins. Barb was raised in Burnaby, graduating from Burnaby North Secondary in 1981, and going on to an outstanding career of studies at Simon Fraser University. 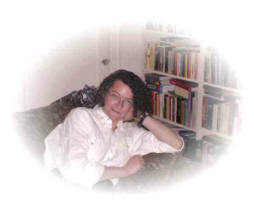 Completing a Master’s of Arts (English) in 1992, Barb began her career as an instructor of English and W omen’s Studies, teaching at Okanagan University-College (Kelowna) and College of the Rockies (Cranbrook), before coming home in 1998 to teach at SFU’s English Language Institute. Barb found her real vocation working in the labour movement, starting with her role as head of the Faculty Association at College of the Rockies. Shortly after returning to Vancouver, she moved from post-secondary education into full-time union work, first with the Canadian Union of Public Employees, then with the Federation of Post-Secondary Educators, where she was working at the time of her death.Â In both posts, she used her articulate, persuasive intelligence and her compassion to advocate for workers rights and dignity. Barb was blessed in love and family as well. 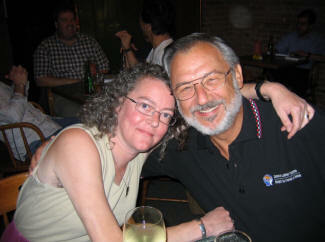 For the past six years, she found home and happiness in the love of husband Mike. Together, they shared many passions – for social justice, for family and friends, for books and folk music, for the boys (Rebus and Theo), and for travel to hot, sunny places. Barb quickly grew to love Mike’s three children, Aaron, Matthew and Michelle, and they her. 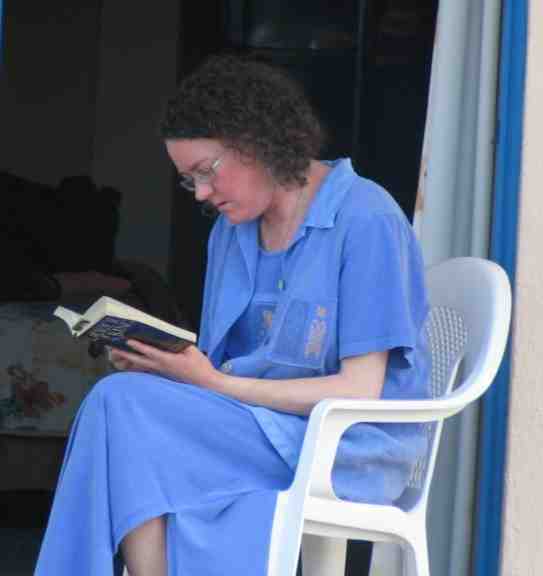 She also took to heart her role as Auntie Barb to Meg Stainsby’s daughters Tillie and Erin, whom she also loved. A memorial service to honour and celebrate her life was held Thursday, October 25th, 2007, at 2 pm, at the Operating Engineers Hall, 4333 Ledger Avenue, Burnaby. Gordon Laird presiding. The following links will take you to: Barb Brown Memorial service Program, Gordon Laird’s remarks/notes, Andrea Lebowitz’s Eulogy for Barb, Leo McGrady’s Notes Celebrating Barb Life, Prelude and Postlude Music for Barb’s Service , Barb Lives lived Globe & Mail, Online Guest book where you can view and Post comments , Barb’s Photo Collage. This picture says much of what I want to say and am at a loss to say right now. And, as my beloved Barb would say, “That’s a good thing”. In the Guest book linked to above I have thanked Barb’s and my immediate families, and those directly involved in her memorial service for being such tremendous sources of strength and comfort. There are so many others who have also been a source of comfort, that I couldn’t name them all in the guest book, although they are named in my heart. Among these are some individuals, unions and organizations who also helped make the unbearable bearable by easing and/or relieving me of some of my burdens. They include: Brother Barry O’Neill and the other officers and staff at CUPE BC, Brother Paul Moist and the other officers and staff of CUPE, Seth Klein and staff at the CCPA, Sister Oliver and Staff at FPSE, and Sister Lean Dawson, The Corrigans, Harvey De roo, and Leslie Molnar. To all of you named here, in the guest book, and in my heart, thank you for taking Barb and I into your hearts. 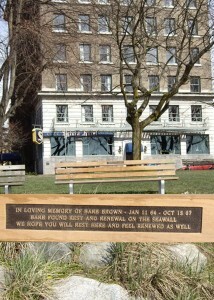 Love, Mike Barb’s Bench is located on the Seawall below Beach Avenue and the Sylvia Hotel between Denman and Gilford Streets! It is quite popular with those who walk the seawall and of course family and friends who find folks quite willing to share it.